Mail in Mac OS X has progressively grown from the simple mail client Apple included with the first builds of Mac OS X into one of the best email solutions for the Mac, and certainly the most popular. As the default app for email on the Mac, Mail gets lots of feature requests and lots of complaints when things don't work as expected. For example, Mail 2.0 in Tiger drew gasps from its use of nonstandard toolbar icons that grouped functions together in bubbles. Apple has significantly updated Mail for Mac OS X 10.5 Leopard, introducing support for Notes, To Do reminders, RSS feeds, Data Detectors, and HTML Statonery. Here's a look at what's new. This report goes to great lengths to follow the origins, history, and maturity of the Apple's Mail client. For those readers with limited time or who are only interested in what's due in Leopard, you can skip to page 3 of this report. In the early 80s, Apple began work on outlining an office-centric system for file sharing, printing, and messaging called the Macintosh Office. Steve Jobs hoped to aggressively target the new Mac at businesses, staving off the advancement of the then very simplistic IBM DOS PC by offering a sophisticated, integrated system of networked workstation class machines. Apple CEO John Sculley feared that Jobs' plans for the Mac might spread the company too thin and prematurely kill its current cash cow, the Apple II. Jobs lost the ensuing power struggle, and wound up departing from Apple and taking his vision for advanced, highly integrated business machines to NeXT. Meanwhile, Sculley's Apple delayed the roll out of various elements of the Macintosh Office plan over a prolonged period. That delay left Apple without a cohesive product for businesses, ceded that market to the DOS PC unchallenged, and pigeonholed the Mac into a role as niche product for graphic designers. As originally conceived, Job's Macintosh Office would first deliver brain dead simple networking and file sharing, then migrate the Mac from its appliance origins into a "BigMac" workstation and server platform based upon Unix. Apple licensed commercial Unix from AT&T in order to move in that direction. A stronger operating system foundation would allow for further advances in messaging and collaboration. The Mac shipped early support for AppleTalk networking, which enabled it to share files and expensive peripherals such as the 1985 LaserWriter without any complex configuration. Jobs promoted the evolving idea of the Macintosh Office in Lemmings, a 1985 SuperBowl ad which depicted blindfolded users marching over a cliff until one user decides to pull off his blindfold and look around. Further elements of the plan were slow in coming, particularly after the departure of Jobs and his replacement by Jean Louis Gassée, who derided the plan as the "Macintosh Orifice." Gassée pulled Apple out of its partnership with workstation vendor Apollo, which the company had been working with in an effort to port the Mac desktop to its line of workstations running the Unix-like Domain/OS. That move left the blindsided Apollo scrambling for a new strategy, and it was subsequently bought up by HP. Gassée also snubbed AT&T and other vendors which had expressed interest in licensing the Mac desktop for their Unix workstations. Four years after the arrival of the original Mac, Sculley's Apple released its own Unix distribution for the Mac called A/UX, but it wasn't integrated with the Mac System 7 desktop until version 3.0 in 1992. Apple also finally released a standalone AppleShare file server in 1988, and announced plans to expand its server offerings into a messaging and collaboration system called the the Apple Open Collaboration Environment (AOCE) shortly afterward. However, by then Apple's over-architected plans had little chance of gaining much acceptance, and the company wasn't doing a very good job at actually developing usable technology. In large measure, that was because the classic Mac OS wasn't designed to serve the needs of a server platform. Under Sculley, Apple also largely backed out of the application software to avoid stepping on the toes of its third party developers. QuickMail, FirstClass, and Microsoft Mail were among the first email programs for the Mac, which also made them among the first graphical email clients on any computer. Microsoft later ported its Microsoft Mail to Windows, where it competed on the PC against the very popular DOS-based cc:Mail. 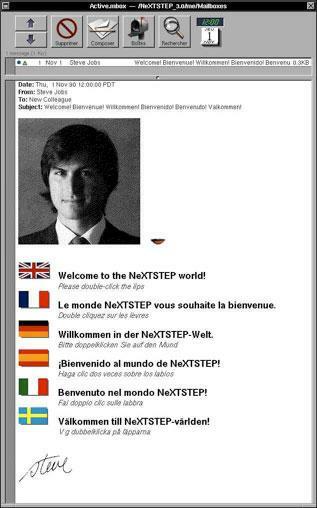 After leaving Apple, Jobs accomplished at NeXT what he hoped to do with the Macintosh Office. Its NeXTSTEP operating system was developed on top of a Unix foundation with the intent of delivering advanced networking and collaborative functionality. Among the advances NeXT demonstrated as early as 1988 was NeXTMail (below). It allowed users to include rich text in multiple fonts, use drag and drop to include embedded graphics or file attachments, and could even include audio recordings using the built in voice annotation feature called Lip Service. It also supported 'mailfaces,' a feature which collected and set up a database of mail contact photos and matched them to incoming emails. NeXTMail could also consult a corporate directory service to look up contacts, years before Microsoft even promised to deliver similar features in its Exchange Server product, which didn't ship until 1996. By then, NeXTSTEP had sat in maintenance mode for years after giving up on trying to sell its operating system in the PC market locked up tight under Microsoft's monopoly control. New NeXTMail users were greeted by a welcome email message which included a voice recording from Jobs (below) and his signature. 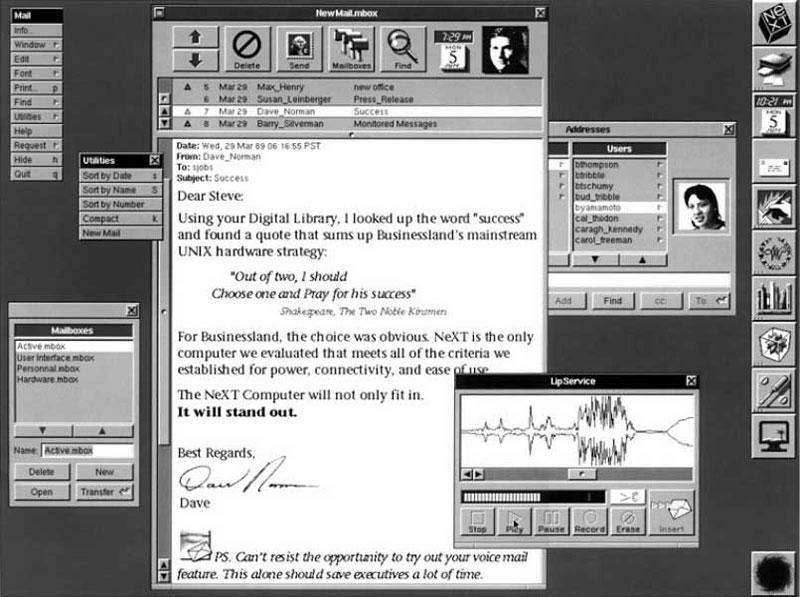 Jobs demonstrated the advanced features of NeXTMail in a 1992 NeXTSTEP Release 3 Demo presentation that is now on YouTube. Lotus Development bought cc:Mail in 1992 in an effort to migrate its users to Lotus Notes. However, the transition pushed many users with simple email needs to adopt the far more complex Notes groupware software. That left an unfilled hole for a less ambitions product to fill. In 1991, Bill Gates outlined an initiative to match the features of NeXTSTEP in the presentation of Cairo, a code name that first referred to an operating system product that would follow the first release of Windows NT, and then later petered out into what Gates would described as a "product vision." By 1997, Microsoft stopped talking about Cairo entirely, but some elements of it resulted in actual products within the same decade. 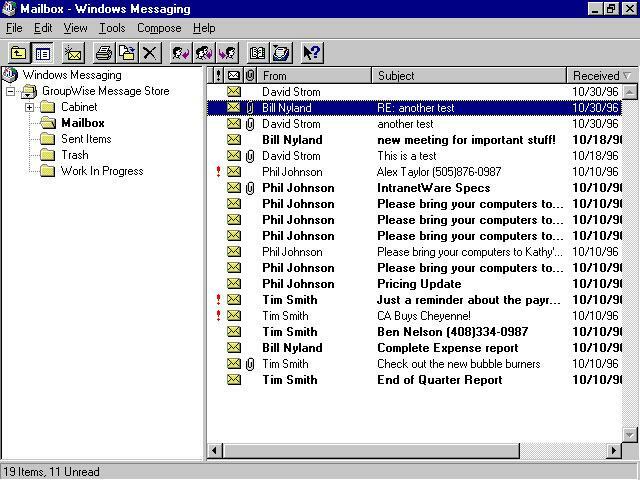 One of the most significant examples was the 1996 release of Exchange Server and the Exchange Client email program (below), which later became Outlook for Windows and Entourage for the Mac. With the release of Exchange, Microsoft sold off its existing Microsoft Mail product for the Mac to StarNine. Exchange cleaned up the low end of the PC market, which had largely been stuck with Lotus cc:Mail and lacked any simple migration path outside of upgrading to Notes. Exchange has since expanded upward in the market to compete against Lotus Notes directly, which is now owned by IBM. On page 2: Apple's PowerTalk and CyberDog; NeXTMail at Apple; Mail in Mac OS X; and Tiger Mail 2.0.